Why Does Unemployment Match Consumer Confidence Index? In a previous post I investigated the variables that influence unemployment. The first variable was tax rates. Many people, including very influential people and even candidates for the President of the United States, make the statement that lowering taxes will increase the number of available jobs. Their rationale is that lowered taxes will make it easier to compete in the market so production will be up and hence jobs will rise and unemployment will fall. What actually happens is often the exact opposite and instead of the extra money going to increased productivity, it goes to increased profitability. 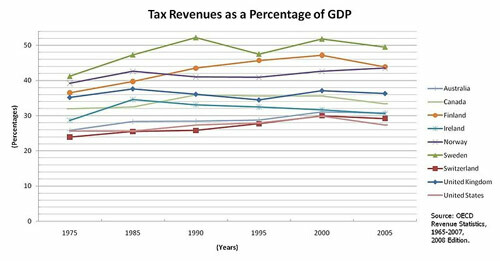 In fact, if you examine the history of the US in recent years, increasing taxes (not lowered taxes) were almost uniformly followed by lowered unemployment. Another worry expressed by many is that the tax rate in the US is too high. In fact, as a percentage of GDP, the US has one of the lowest tax rates in the world. Corporate tax rates in the US are currently fairly high compared to other developed countries. But a comparison of countries with high and low corporate taxes shows that unemployment is unrelated to the corporate tax rate. The best match by far of the available variables to unemployment was the Consumer Confidence Index. This is so good a match I wondered if there was a variable inside the index that ensured a match, but because the index is attitudinal and the unemployment rate is actual numbers, they are independent variables. The next variable that seemed to be related was the industrial rate of production. This makes sense because as production rises, the number of employees needed will likely increase, and as production declines, the number of employees required also declines. 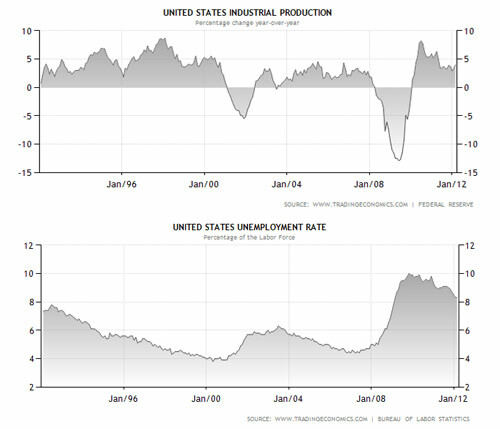 In the chart, you can easily see that when there are sharp declines in production, the unemployment rate increases. When production is up, unemployment steadily declines. Radio and television broadcasters, TV personalities, and politicians often discuss the rate of unemployment, or the number of unemployed people as if these were values that only go up and down with the economy. In actual fact, even if the unemployment dropped magically to zero today, and a law was passed making it illegal to fire anyone for any reason whatsoever, tomorrow there would unemployed people. By the end of the year, if no one was hired and no one was fired, there would be approximately three million unemployed people in the United States, and they would mostly be young people and immigrants. How can this be? It is because the United States (and most other countries as well) is in a very unstable situation. 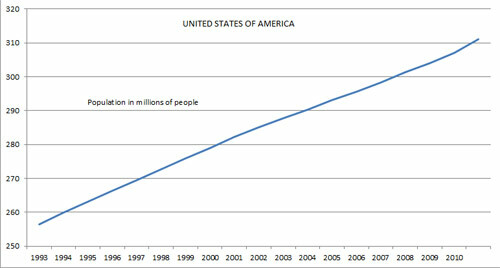 The population of the entire nation grows every year by just about 1%. Unemployed people are produced just as fast as the population grows. So unemployment automatically grows by 1% per year unless increased demand by industry hires them that fast. Even if industry is healthy and stable, unemployment will grow at 1% per year. Ten years of steady industry will mean 10% unemployment. Industry itself must grow at 1% per year and employ people at the same rate as in year 1. Industry however, is constantly looking for ways to lower labour costs, so either wages will go down as unemployment increases (because more people are willing to take low paid jobs), jobs will be sent offshore, or jobs for people will be transferred to robots or mechanized processes. So it takes more than steady industrial production to keep people employed (not that keeping people employed is the purpose of business), it takes an accelerated rate of production of about 1% per year just to stay even with the increased population. So how do people know when times are going to be tough in advance of the tough times happening? People, whether they are employed, unemployed, business owners, or capitalists, are all biological beings — everyone is an animal. We are very fortunate to have inherited many of the instincts that were given to us by our evolutionary heritage. One of the most acute senses among animals is the ability to predict when resources such as food and water are going to be scarce. This is probably not done using any intellectual ability, it is simply the body and its sensory apparatus reacting to trend changes in the environment. We undoubtedly do the same, and because we also have a strong intellectual capacity, at least potentially can add brain power to the way in which environmental trends are detected. In animals, the reaction to predicted tough times vary, but almost always involve some changes to their physiology and to their behaviour. If it is possible, many animals travel to areas where they know the “grass will be greener.” Others will go into a type of hibernation or aestivation where their metabolism slows down dramatically. If this is not possible, some animals will slow down or temporarily cancel the urge to reproduce. If the changes are rapid, some females will automatically abort so that they do not fruitlessly invest in young that have no chance to grow up. And there are many other adaptations that automatically click into place when tough times are predicted. Of course, when good times are predicted all the tough times changes are placed in reverse — lots of babies, high levels of activity, and so on. The Business Confidence Index was not a good indicator of unemployment rates. Business is not especially concerned with unemployment rates. Employees come and go as needed. The most important aspect of employees from a strictly business perspective is cost. Business owners know that if they need to lower costs, they can negotiate lower wages or trade expensive employees for cheaper employees. It is only in really bad times that they know major changes in employee numbers will be needed, but even that is only an adjustment, and if handled well will ultimately not have much effect on the bottom line. On the other hand business owners are also people and therefore are also animals, so they react to the overall environmental trends on a visceral level as well as an intellectual level. They as people can predict unemployment rates. So if they are included in a survey of consumer confidence indices they will be just as effective at predicting unemployment rates, even though that does not significantly affect their business confidence. Before pants were widely adopted as standard clothing for women, there was a remarkably close relationship between the length of women’s skirts and the health of the economy; the longer the skirts the poorer the economy, the shorter the skirts, the better the economy. I often wondered if laws were passed to raise the skirt length, would that have a real impact on the economy. Needless to say, that experiment was never tried, but it is an interesting example of a relationship between two variables (skirt length and the economy) that might, or might not, have any causal relationship. However, just like the consumer confidence index, women were not consciously linking the length of their skirts to the economy, the two are more visceral-level responses. So it is quite likely that any attempt to artificially shift the length of skirts or increase consumer confidence would likely fail because it would not ultimately be viscerally convincing. It is important to note the close link between the predicted unemployment rate by the consumer confidence index and use that as a predictor of trends to come. The time frame available for using that prediction to take action before the downtrend starts is not long, a matter of months, but it is nonetheless present. In the next blog I will examine the notion of who is or should be responsible for the unemployed, and what should be done if anything, and by whom. This entry was posted in Economy and Biology by AlanEmery. Bookmark the permalink.